‘The scene looped in his head. He resisted at first, then let go until it became the background to his insomnia. He thought that maybe through constant remembrance he could remove himself from the situation, like it would be a clip from an old movie. Roy wakes up with a hangover. It’s not just any hangover either. It’s probably the best described one I’ve come across. All he wants is to lie still and let the pain wash over him until it becomes reduced to the constant hum of discomfort, only his girlfriend isn’t going to let him do that. Instead she’s going to kick him out onto the streets. We can’t be sure why she’s doing this, but can be pretty confident he deserves it. We can also be pretty certain that this is about as good as it’s going to get for Roy, for it’s unlikely good fortune is ever going to shine upon him. The only person he has left to turn to is Banksy. Banksy’s another waster. A dope sucking, computer game addicted drug pedlar who’s too lazy to do any deals. He’s so low, he’s even going to charge his only buddy rent to let him sleep on the couch. Off they go to a nightclub. It’s thirsty work and Roy hits the drink in the same hard way he has to every day to keep functioning. And bad things happen. This is a wonderful story, told with skill and the confidence to be uncompromising at every turn. Roy’s no angel. In fact, Rhatigan throws so much of the man’s crap at you that he should be utterly despised. Thing is, I kind of like him. It’s difficult not to be sympathetic to a guy who just wants to get through life with a drink in his hand and with a few smokes without hurting anyone along the way. His daily battle with the mundane routines of his job at the Bullseye store is brilliantly told and I doubt there’s anyone out there who had done a crappy job or one they’re stuck with who won’t recognise his pain and won’t blame him from wanting to escape in any way he can. The twists and turns of Roy’s life as it circles the plughole are hypnotising. There’s no way he can avoid that gravitational force pulling him downwards, but it’s great watching him try. A cop named Walsh adds a good deal to this story. He’s a fantastic creation and if there was a new detective I wanted to read more about, this guy would be the one. He wouldn’t play things by the book and there wouldn’t be a cliché in sight. 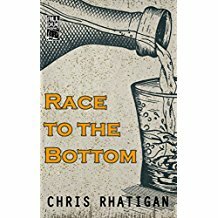 Race To The Bottom (US) is another Chris Rhatigan book to treasure. It’s scary how good the guy’s writing is and how it improves by notches with each new work. It’s also difficult to imagine the kind of aces he’ll be pulling from his sleeve in years to come. How wonderful it is to have such fiction to look forward to. More please. The Pusher (US) is another cracking read in the 87th Precinct series. Steve Carella is back from honeymoon. 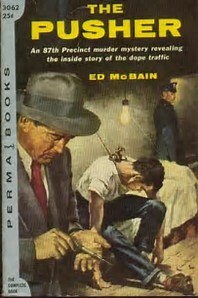 A junkie meets an untimely end and the manner of his departure is suspicious enough to suggest something other than suicide. There’s a syringe next to the corpse, but the body is also hanging by the neck and the two things don’t fit easily together. Enter Lieutenant Byrnes, the head of the force. As he delves into the murky world of drug dealing, he is informed by anonymous source that his son is not only a junkie, but that his fingerprints will be found on the syringe left next to the corpse found at the opening. These two strands mingle throughout, offering the usual balance between police work and personal lives that makes McBain’s stories so well-rounded and engaging. This one has a massive incident. It came at me as a total surprise and had me reeling. It also has a beautiful chapter about Carella’s main informant, Danny Gimp, so bitter-sweet that if it were a marmalade it would be my favourite. There’s the usual quick and easy ending to the investigation that’s satisfying even though it shouldn’t be and a personal ending that would grace the finest novel. If there’s a flaw, it’s the more-exaggerated-than-usual issue with point of view, but it’s part of the style and almost an element of the charm. Throw in an afterward by the author that leaves you wondering what might have been and The Pusher’s a total winner. I’ll start by putting this into context. Thirty years or more ago, my brother and I got into gambling. We tried lots of different approaches. Among them was a foolproof system of betting on the dogs. I’d drop Geoff down at the track, he’d spend a night watching Bugsy spinning around the arena and we’d count our winnings. Except they were rarely winnings now I come to think of it, which I guess made us the fools. In later years, I got into visiting Walthamstow, a stadium that was beautiful in itself and had pictures up in the bar of a visit by George Raft from way back. I can also remember being down at a bookie’s in Kentish Town feeling flush after a fair win one night after work. When the cash was gone, I went to my savings account and took out the last five pounds I had in the world (pretty low times now I can reflect on them). I put the fiver on the likely one-two-three and what do you know? They only came in and netted me a fair stash. Several hundred pounds as I recall. Needless to say it was all gone by the end of the week and I had to move out of my flat. I’m leaving my tale of woe right there. It’s no wonder that when I see all the gambling adverts on the TV or plastered over the waistcoats of snooker players and the like that I feel despair. In case you’ve ever wondered where the companies get their huge advertising budgets, I’ll point you in the direction of the punters. I mention that to explain why Dark Hazard had so much appeal to me. 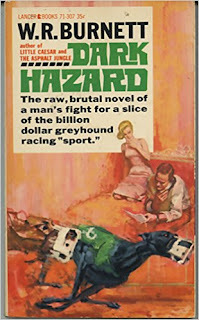 On the front cover ‘The raw, brutal novel of a man’s fight for a slice of the billion dollar greyhound racing sport.’ Of course I was going to be interested. Being interested in a subject is never enough to make a good story, however. We all know that there’s so much more to fiction than that. So here are some of the reasons I absolutely loved this one. Every chapter is full of drive and energy. The protagonist is always on the edge and the next pitfall lies just around the corner. None of the holes feels like a contrived piece of digging, it’s just the way Jim Turner is made. We know he can’t resist a detour from his dreary existence, not matter how hard he tries to keep life straight. Jim has everything to lose and he’s such a great creation that the idea of him putting his world into jeopardy leaves a reader in a state of almost constant anxiety. The murky world of the dog track and all its characters is a delight to hang around in. The alternative Jim has to a life of excitement and flowing juices is one of the steady and the mundane. Settling into a place where respectability is the main goal and religion provides the fuel for existence is a suffocating prospect. The writing is tight as hell. Dialogue uses just the words it requires. The sentences are mainly spare, yet there is still room for insightful observation and detailed description. Each environment comes to life in all its dimensions, yet this is never presented as clutter. There's no more or no less than is needed. And Dark Hazard. He’s the star of the show. A sleek black dog who goes about life with no fuss or frills. He’s talented, beautiful and fragile. It’s no wonder Jim falls head over heals for him and no surprise that in his obsessive way he’ll do practically anything to get to own him. Loved this one. The time and place are perfect for such stories to be told and the quality of the story telling is about as good as it gets.